Rawdons Country Hotel in Nottingham Road Where we had the most amazing lunch! We finally were on my home turf! Being born in Durban and having spent 5 years st school in the midlands of KwaZulu-Natal, this wa the part of the trip I felt most at home in. We left the lush, tropical woodland of Durban behind and climbed the winding N3 towards the midlands towns of Pietermaritzburg, Howick and Mooi River. The forests make way to rolling green hills grazed by cattle, you’re immediately reminded of English countriside, almost more English than the real thing. The best way to travel through this part of the world is to use the R103, the old main road between Durban and Johannesburg, this goes via all the little towns and villages and lush farmland. Many will know this area for the “Midlands Meander” an arts, crafts and dining route where locals open up their farms, houses and hotels to passers by to eat at, stay at and buy hand-made trinkets. In my opinion, no visit to the Midlands is complete without a stop at one of the oldest hotels in South Africa, Rawdons Hotel. The manager there, I remember serving us as child, a very British colonial elderly Indian man who has now been working there for what must surely be a record 51 years. 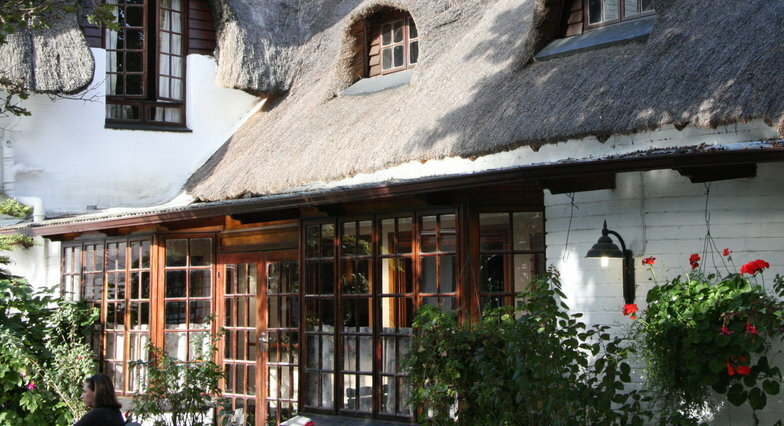 The thatched building hosts both the hotel and pub which serves traditional and delicious English pub lunches. We made sure to tuck into fresh fish and chips with a rich beer batter, local smoked trout and wholesome and generous portion of home-made steak and ale pie! Another unique point to note about Rawdons is it’s on-site local brewery (The Nottingham Road Brewing Company) which brews tasty beers from lagers to guiness-style varieties which perfectly compliment any of the delicious pub-lunches. Sadly we said goodbye to the comfort of the pub to say hello to the road to Champagne Castle. Again the scenery changes and views open up to dramatic mountain vistas with the sharp crags and mist-swept peaks drawing you closer. Winding up the mountain passes with our soccer-ball laden trailer (slowly, very very slowly), we passed Zulu villages and farms, groves of trees and finally reached the stunning Champagne Castle Hotel with it’s thatched cottages and rolling lawns. Check out our pics on Flickr!